This week’s High Five Friday goes out to Steve Payne, from TWO MEN AND A TRUCK ® London, Ontario! Our Core Purpose here at TWO MEN AND A TRUCK® is Moving People Forward and that goes for our employees as much as it does for our customers. The TWO MEN AND A TRUCK® franchise system offers fantastic opportunities for career growth and advancement. So this week we want to highlight one of the many people who has moved their careers forward with TWO MEN AND A TRUCK®. Brent Welsh, Franchisee and General Manager of TWO MEN AND A TRUCK ® London, Ontario had this to say about Steve Payne, his Assistant Operations Manager. We chose Steve to take on the Assistant Operations Manager role because of his consistent performance on the trucks. His positive attitude, sense of humour, and his ability to relate well with customers and crew members alike. Steve has a strong work ethic, good customer service skills and is proficient with today’s technology and software. 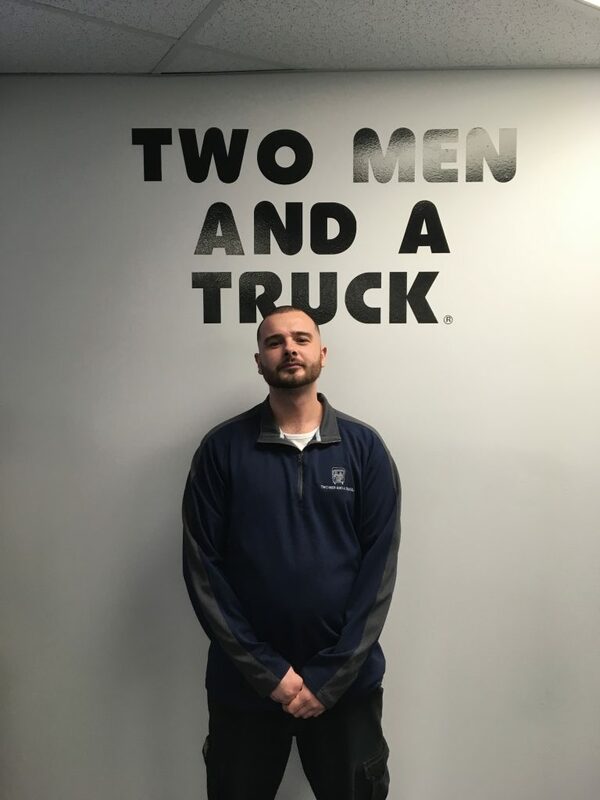 We asked Steve about his time with TWO MEN AND A TRUCK ® London, Ontario, and what kinds of career paths are available to newcomers; here’s what he had to say. I started with TWO MEN AND A TRUCK ® London, Ontario back in June of 2012 as a mover. On top of the job getting me into the best shape of my life, it also taught me about customer service through the core values of TWO MEN AND A TRUCK®. I loved the idea of a company having a set group of values to not only work by but also live by. The best part of working for TWO MEN AND A TRUCK® is the substantial room for growth in the business. Movers can become drivers, drivers can learn the behind the scenes and become estimators, and eventually all the way up to management roles. As of May 2016, I became an Assistant Operations Manager for TWO MEN AND A TRUCK ® London, Ontario where I continue to grow and learn. It’s now 2018 and I couldn’t imagine being anywhere else. I look forward to seeing where my journey through TWO MEN AND A TRUCK® takes me next. I’d like to thank Heidi, Brent and Des for the opportunity to grow and learn new things while having fun in the process. Thank you, Steve. Being known as the Movers Who Care® doesn’t just happen because we say it. It happens because we do it. We’re all proud to be a part of a company that provides such a wide variety of career opportunities. Thank you for being a great example of how a person can start out as a mover, and end up being an Assistant Operations Manager. High Five!